The Organisation for Economic and Co-operation and Development released new results for its well-regarded PISA exam on Tuesday, December 6, and American students’ scores stagnated in Reading and Science, while continuing to drop in the other tested subject, Mathematics. The scores are officially for the 2015 PISA exam; the test is administered to 15-year-olds every three years. PISA – which stands for Programme for International Student Assessment – gives a comprehensive assessment exam that allows educational results to be studied via a common standard across nations. The exam has three subject categories: Math, Reading, and Science. The 2015 test was taken by 540,000 students in 72 nations, including nearly 6,000 American students. The previous two exams were given in 2012, and 2009. 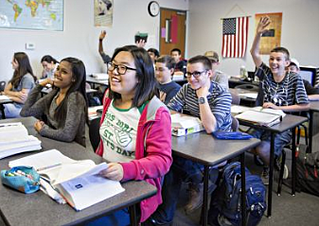 21 BASIS Independent Silicon Valley Students Honored as National Merit Semifinalists!